There are entire chapters dedicated to Unicode, packages, modules, debugging, security, formats, and overloading, plus 40 pages dedicated to objects as well plenty more pages of practical modules you can use. The real function of the book is twofold. First, to act as a reference that prepares you to tackle any problem, no matter what it is; essentially, be an entire troubleshooting repository in one place. Second, it’s a great way to deepen and expand your understanding of the Perl ecosystem and the language, so you are better equipped to use and deploy scripts to solve problems on your own. There are, of course, some drawbacks to writing an expansive book on a complicated topic like Perl. First, organization. 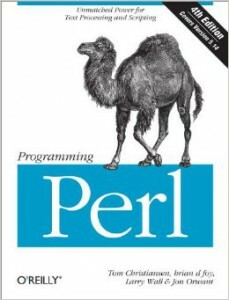 While Programming Perl is an excellent resource and a good reference, it can be tricky to find what you’re looking for in the 1,000 plus pages of examples and explanations. This is, of course, somewhat mediated by an outstanding index, but there’s always going to be a struggle for some things. Second, the book, while an excellent guide and useful for pretty much anyone doing serious work in Perl, does (out of necessity) skip some of the very basic elementary things. Stuff that very early beginners to Perl might require to get off the ground, like really basic coding explains or explanations to form a picture of what on earth Perl is. For most people who have done some server side programming (especially in C) then this shouldn’t be too much of a problem, but for web programmers who have only worked in HTML or Java, a more introductory text might be best. That said, if Perl programming is going to fill your days, it’ll probably be worth buying this book now in preparation for things to come.